With this article, you will be able to install TWRP Custom Recovery on Samsung Galaxy A8 and A8+. Recently, TWRP team has extended their support to Samsung’s A series smartphones. Thanks to the developer community, now we should see a number of mods, themes, and custom ROMs in the XDA developer forum specially for Galaxy A8 and A8+. Moreover, TWRP is a versatile utility that offers excellent features like partition format, flash ZIP, wipe Dalvik cache and more. 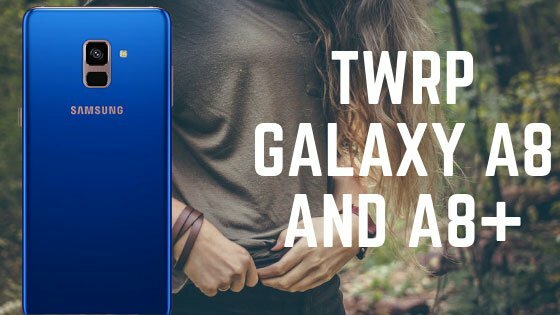 Read ahead; we have a guide below on how to install TWRP on Galaxy A8 and A8+ with official download links. As compared to S flagship line, Galaxy A series provides high-end specs at the low price range. Since TWRP officially released for Galaxy A8 / A8+, we expect Android 9.0 Pie custom ROM from XDA soon. Apart from installing a custom ROM, TWRP also let you flash Magisk or SuperSU to gain root access on your device. Even more, you can create a full nandroid backup using TWRP, which can unbrick your device if anything goes wrong on installing custom ROM. Thanks to the effort of XDA Senior member BlackMesa123, TWRP for Galaxy A8 and A8+ are officially available. Official TWRP access means the recovery is in stable status and official build an be download from the TWRP website. You may expect the future updates from the support team too. As you continue reading below, we will guide you on How to Install Official TWRP Custom Recovery on Samsung Galaxy A8 and A8 Plus. We have made sure that we will give enough details of each step so that a first time user won’t get confused. Read further to find out How to TWRP Custom Recovery on Galaxy A8 / A8+. You can quickly install TWRP Custom Recovery on Galaxy A8/A8+ using the tutorial below! Samsung Galaxy A8 and A8 Plus got a lot of developments due to its popularity. The phone will be getting a huge number of custom ROMs based on Android Oreo and Android P. You will be able to install most of the ROM via this TWRP recovery. So, you can enjoy the all the benefits of the latest TWRP custom recovery on your phone. Versions: A530F (Europe, Global Single-SIM); A530F/DS (Global Dual-SIM). Also known as Samsung Galaxy A8 (2018) Duos with dual-SIM card slots. Versions: A730F (Global Single-SIM); A730F/DS (Global Dual-SIM). Also known as Samsung Galaxy A8+ (2018) Duos with dual-SIM card slots. Proceed to the tutorial below, ONLY if you own any of the above-mentioned Galaxy A8 or A8+ models. This tutorial works on Galaxy A8 / A8+ running Android 8.0 Oreo and all future updates. We have written full step-by-step instructions on How to install TWRP recovery on Samsung Galaxy A8 and A8 Plus. If you are entirely new to rooting, flashing a Custom ROM or an Official Firmware, please read the entire tutorial once before actually performing it on your device. For Galaxy A8 2018 (jackpotlte): Link! For Galaxy A8+ 2018 (jackpot2lte): Link! Step 8: Once the installation is completed, press and hold [Power], [Volume Down] and [Volume Up] button until the screen turns black. Step 9: Once it does, release [Volume Down] button and hold the [Volume Up] button while still pressing the other button. This will boot your Galaxy A8 / A8+ into recovery mode. You could now see the interface of TWRP Custom Recovery on your device. Hurray! Your Galaxy A8 / A8+ should have got TWRP Custom recovery installed by now. You can try out some of the best Custom ROM from our list on your phone. Next articleDownload Samsung Experience 10 Launcher v10.0.00.51 APK now!